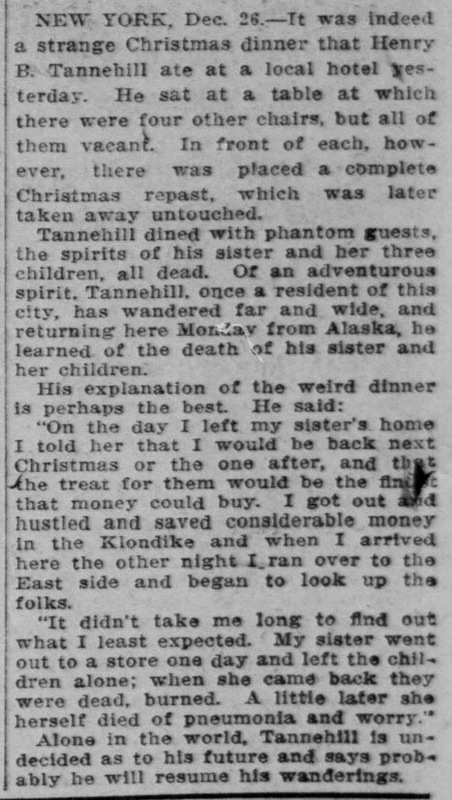 NEW YORK, Dec. 26.-It was indeed a strange Christmas dinner that Henry B. Tannehill ate at a local hotel yesterday. He sat at a table at which there were four other chairs, but all of them vacan. In front of each, however, there was placed a complete Christmas repast, which was later taken away untouched. Tannehill dined with phantom guests, the spirits of his sister and her three children, all dead. Of an adventurous spirit, Tannehill, once a resident of this city, has wandered far and wide, and returned here Monday from Alaska, he learned of the death of his sister and her children. His explanation of the weird dinner is perhaps the best. He said: ‘On the day I left my sister’s home I told her that I would be back next Christmas or the one after, and that the treat for them would be the finest that money could buy. I got out and hustled and saved considerable money in the Klondike and when I arrived here the other night I ran over to the East side and began to look up the folks.